Grind them, dry-roast them, or fry them. Combine them to create subtle flavors. Perhaps more than any other cuisine in the world, Lord Krsna’s cuisine fully explores the six basic tastes—salty, sweet, sour, pungent, astringent, and bitter—in innumerable combinations. Just as all colors come from the three primary ones—red, blue, and yellow—all tastes are combinations of these basic six. Spicing is important. For example, the spice fenugreek can be used to create a hint of bitterness—a taste that’s practically unknown in Western cooking. But when properly prepared and served with complementary dishes, bitter tastes are welcome (some people even favor them). Similarly, there are sweet spices, like cinnamon and cardamom, pungent ones like cayenne, and mixed tastes like cumin and coriander. 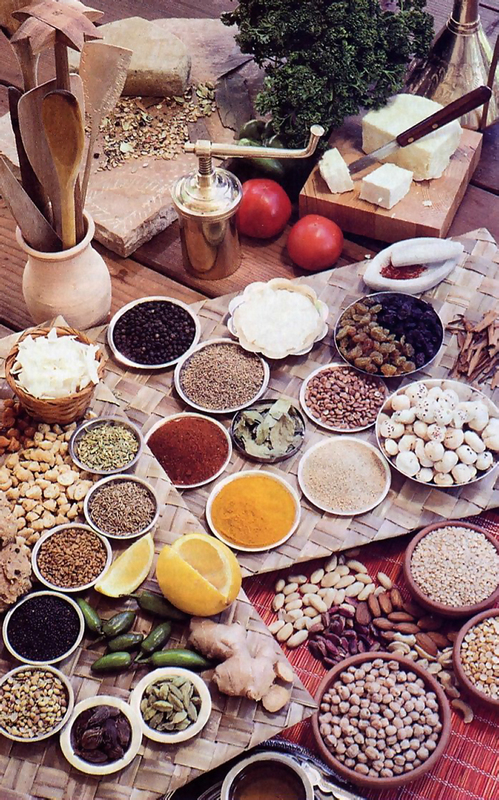 Spices influence not only the taste of food, but also the appearance, texture, and aroma. There are basically four main techniques in spicing. First, you can grind whole spices into fine, dry powders. Second, you can slowly dry-roast them to release their dormant savory strength and then roughly bruise them to produce coarse, robust powders. Third, you can grind spices with liquids into moist, smooth pastes. Finally, you can brown whole spices in small quantities of ghee or vegetable oil and add them to the dish while cooking. You can also combine powdered spices in innumerable ways to make garam masala, a versatile ingredient in this type of cooking. Garam masala is a combination of from four to fourteen powdered spices and is welcome in many dishes—rices, dal soups, chutneys, savories, and snacks—to enhance the flavors of the other ingredients. Please don’t confuse garam masala with curry powder. Curry powders usually have turmeric, red chili powder, and asafetida, ingredients hardly ever used in garam masala. We don’t use curry powder in cooking for Krsna: it stamps dishes with a stereotyped golden color, a crude, hot flavor, and an overpowering aroma. By contrast, different garam masalas may be piquant, sweet, tangy, or peppery, but they’re always a harmonious blend of subtle flavors to heighten—not smother—food’s natural flavors. As you cook for Krsna, you’ll want to become familiar with these spices and use them judiciously so that He’ll be pleased by your sincerity and devotion. It’s natural to want to serve Krsna, because as spirit souls we are part and parcel of Krsna. And the part serves the whole, just as the hand serves the body. 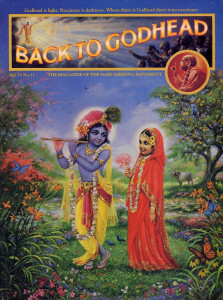 Krsna is eternal, the soul is eternal, and the devotional service we render to Krsna is also eternal. When we die, we leave behind all our material as sets. But our devotional assets we retain. And if we don’t have an iota of material desire left, then we don’t have to take birth again in this material world, but we go back home, back to Godhead, to enjoy our eternal relationship with Krsna. As devotees of Krsna we constantly try to engage our senses in devotional service We’re confident that spiritual life is real and attainable. And one of the important ways to attain it is by cooking, offering and eating krsna-prasadam. Used in seasoning a wide variety of vegetables, dals, soups, salads, and savory rice dishes. 1. Pour 1 cup of seeds onto one end of a cookie sheet or metal tray and slowly move small portions of them across the surface, removing any foreign matter or hard kernels. Clean the remainder of the seeds in the same way. 2. Preheat a large iron frying pan over a low flame for 4 to 5 minutes. Pour in the seeds and dry-roast them for 15 to 20 minutes, stirring occasionally. The seeds should be lightly toasted to release their bouquet, but not browned. 3. Measure 3 tablespoons at a time into a coffee mill. Grind the seeds with 3 short bursts of the mill. Partially crush the seeds, but don’t powder them. Allow them to cool. Pour into a pint jar and finish the remaining seeds in the same way. 4. Seal the jar well; store in a cool, dry place. This combination of five whole aromatic spices is frequently used in a finishing chaunce for Bengali-style vegetables, stews, and dals. The first recipe is mild; the second, a little stronger. 1. Remove any foreign matter from the spices. 2. Spread the spices on a large cookie sheet or metal tray and set in the hot sun for 3 to 4 hours. 3. Mix well and store tightly sealed. There are only four ingredients in this well-balanced masala. It’s a little savory, a little sweet. 1. Preheat the oven to 200° F. Spread the ingredients on a cookie sheet or metal tray and bake for 30 minutes. 2. Combine the coriander seeds, cumin seeds, and whole cloves in a small bowl. 3. 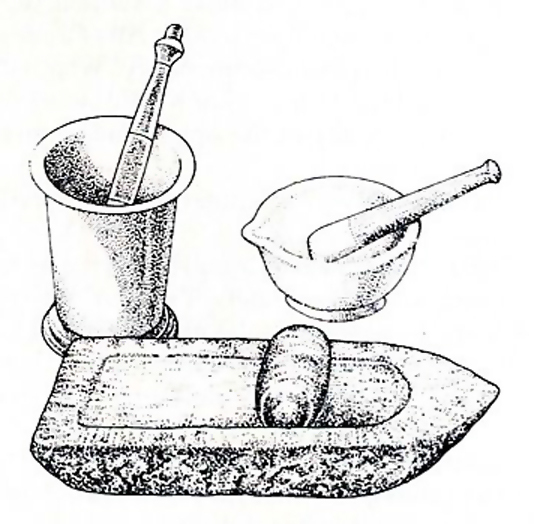 Place the cardamom pods on a stone mortar and gently tap the pods to break them open. Pull apart each pod and shake out the seeds. Discard the pods. Add the seeds to the other spices and mix well. 4. Place ¼ cup of the spice mixture into an electric coffee mill and grind for approximately 1 minute. Empty the powder from the mill into a fine metal sieve and sift out the husks. Grind and sift the remaining spices. 5. Transfer the sifted powder to a 2-cup jar and seal tightly. Store in a cool, dry place. A well-rounded, delightfully mild blend of spices. 1. Preheat oven to 200° F. Spread the spices on a cookie sheet. Bake for 30 minutes and remove. 2. Combine the coriander seeds, peppercorns, cloves, red chilies, and cumin seeds in a bowl. Place the cinnamon sticks on a stone mortar and pulverize to a coarse powder. Add to the other spices and mix well. 3. Pour ¼ cup of the spice mixture into an electric coffee mill and grind for 45 to 60 seconds or until pulverized into a light, fluffy powder. Pour into a fine metal sieve and shake to sift the coarse husks from the powder. If desired, grind the coarse husks on a stone mortar and pestle until powdered. 4. Mix well, seal tightly in a jar, and store in a cool, dry place. A fine-textured spice mixture with a salty, slightly sour flavor, this masala is especially suited for seasoning sprouted bean dishes, dry chick-pea dishes, and selected dry vegetables. It is frequently used with fruit plates to provide a contrast with the sweetness of tropical fruits. 1. Preheat oven to 200° F Spread the cassia leaves, cumin seeds, coriander seeds, whole cloves, and cardamom seeds on a cookie sheet and bake for 30 minutes. 2. Break the cassia leaves into small pieces and place them on a stone mortar. Pound and grind them to a coarse powder. Combine the roasted spices and roasted cassia leaves in a small bowl and mix well. 3. Place ½ cup of the roasted spice mixture in an electric coffee mill and grind for 1 minute, or until the mixture is pulverized to a very fine powder. Transfer the powder to a fine metal sieve and sift out the coarse ingredients. Repeat the grinding and sifting process with the remaining spices. 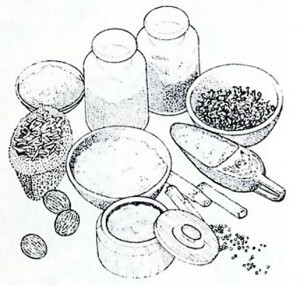 Collect the coarse spice remnants and transfer to a stone mortar. Pulverize by hand. 4. Combine all of the roasted spice powder with the remaining powdered spices and black salt (available at Indo-Asian grocers). Mix all the ingredients together thoroughly. 5. Transfer to a small jar, seal well, and store in a cool, dry place.